Interstate 585 overlays 2.25 miles of U.S. 176 freeway from U.S. 221 northward at the Spartanburg city line to Business Loop Interstate 85 near Lone Oak. The designation is unique in that it spurs southeast from an Interstate Business Loop instead of a parent or other auxiliary route. 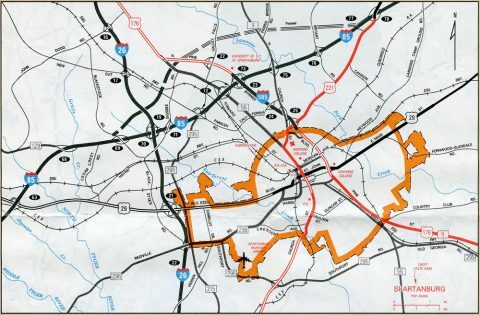 This was not always the case as Business Loop I-85 was signed as Interstate 85 until October 1995. Until 1995, Interstate 585 directly connected with Interstate 85. The 1991 South Carolina Official Highway Map shows the new alignment for I-85 partially under construction. A half mile of U.S. 176 & South Carolina 9 leading south from the freeway end at U.S. 221 (Whitney Road) to Garner Road doubles as Business Spur I-585. A lone I-585 reassurance marker follows Garner Road along Pine Street northbound along the otherwise unsigned Business Spur. Signage was posted as far south as St. John Street (U.S. 29) until 2004, but none exist today. U.S. 176 splits with Asheville Highway at the eastbound beginning of South Carolina 56 for Pine Street. Both routes lead to the city of Spartanburg. S.C. 56 runs along an arterial through Lone Oak to Hearon Circle at Business Loop I-85 while U.S. 176 serves the campus of USC Upstate via I-585. Photo taken 01/16/16. Traffic partitions between U.S. 176 (Pine Street) and South Carolina 56 (Asheville Highway) at a wye interchange. S.C. 56 runs 63 miles southward parallel to the I-26 corridor to Clinton and an end at S.C. 39 near Chappells. Photo taken 01/16/16. U.S. 176 angles east from S.C. 56 through a forested area to a diamond interchange with Interstate 85. Photo taken 01/16/16. Motorists turn onto I-85 south from U.S. 176 (Pine Street) east for Duncan, Greer and Greenville. Photo taken 01/16/16. Interstate 85 joins the Spartanburg area with Gastonia and Charlotte, North Carolina. Photo taken 01/16/16. A U.S. 176 reasurance marker was posted between the ramps with I-85 and Fairforest Road by 2012. The first shield assembly for Interstate 585 does not appear until south of Business Loop I-85. Photo taken 01/16/16. A traffic light precedes the Interstate 585 freeway beginning at Upper Valley Falls Road north and Fairforest Road south. Photo taken 01/16/16. Valley Falls Road branches west from South Carolina 9 (Boiling Springs Road) through Valley Falls to meet Interstate 585 & U.S. 176 at a diamond interchange. The exit was previously signed as Exit 22 but now is unnumbered. Photo taken 01/16/16. An eastbound side frontage road appears where a driveway to an adjacent industrial business once intersected U.S. 176. The Valley Falls Road interchange (old Exit 22) was reconstructed during the 2003-06 project to upgrade U.S. 176 into I-585 by the campus of USC Upstate. Lone Oak lies to the south and North Campus Boulevard from USC Upstate ties in from the north. Photo taken 01/16/16. A new parclo interchange was constructed along with East Campus Boulevard during the 2003-06 upgrade of U.S. 176. East Campus Boulevard forms an arc north from Lone Oak Road around the east side of USC Upstate. Photo taken 01/16/16. An unnumbered ramp carries motorists onto Business Loop I-85 south for the 29-mile drive to Greenville. Business Loop I-85, a 1950s-constructed freeway, was the I-85 mainline until October 1995. Photo taken 01/16/16. A loop ramp departs Interstate 585 south & U.S. 176 east for Business Loop I-85 north four miles to I-85 ahead of Gaffney and Blacksburg. This location marks the original beginning of I-585 south. Photo taken 01/16/16. Former Exit 24 consists of a slip ramp onto Graham Road, a west side frontage road leading south from Business Loop I-85 to California Avenue. California Avenue is an east-west street between New Cut Road at Una and S.C. 9 (Boiling Springs Road). Photo taken 01/16/16. A set of reassurance markers appear for I-585 south & U.S. 176 east as the freeway parallels Chinquapin Creek. Photo taken 01/16/16. Exits 25A/B join Interstate 585 south & U.S. 176 east with U.S. 221 (Whitney Road), Boiling Springs Road (South Carolina 9) north and Church Street south at a split-diamond interchange just outside the Spartanburg city line. Exit 25B previously connected with U.S. 221 only at a diamond interchange. Photo taken 01/16/16. The California Avenue overpass was replaced after it was damaged by a truck hauling machinery in January 2014. A new span was constructed as part of a $12-million resurfacing project that included work at the nearby Church Street overpass in 2015. Photo taken 01/16/16. Roadwork from mid-2005 to mid-2007 added a new ramp from I-585 south & U.S. 176 east to Boiling Springs Road north and Church Street south. The previous ramp (Exit 25B) to U.S. 221 was converted into an access road between S.C. 9 and Whitney Road. Photo taken 01/16/16. Exit 25A is applied to the turns for S.C. 9 (Boiling Springs Road) north to Boiling Springs and Church Street south to U.S. 221 south and Downtown. Exit 25B is the continuation of the access road to Whitney Road, which doubles as U.S. 221 north to Whitney and Chesnee Highway. Photo taken 01/16/16. The Church Street (S.C. 9) overpass was raised two feet to meet Interstate standards and reopened in June 2015. Photo taken 01/16/16. South Carolina 9 merges onto Interstate 585 south & U.S. 176 east to Pine Street. U.S. 221 stays to the west along Church Street through the central business district. Photo taken 01/16/16. Beyond the on-ramp from U.S. 221 (Whitney Road), Interstate 585, U.S. 176 and S.C. 9 transition into a six-lane boulevard (Pine Street) as they enter the Spartanburg city limits. Photo taken 01/16/16. U.S. 176 east & South Carolina 9 (Pine Street) south intersect Pearl Street west and McCravy Drive east at a signalized intersection. Spartanburg Regional Medical Center lies to the west and Pinewood Shopping Center to the east. Photo taken 06/01/07. Pine Street continues with six overall lanes to Cleveland Street ahead of a high Norfolk Southern Railroad crossing. Photo taken 01/18/04. Pine Street proceeds under the NS Railroad line and then intersects the eastern terminus of South Carolina 296 (Daniel Morgan Avenue). South Carolina 296 encircles the Spartanburg central business district before turing west to Spartanburg Downtown Memorial Airport (SPA), Exit 22 of Interstate 26 and Reidville. Photos taken 01/18/04. Main Street carried U.S. 29 through Downtown Spartanburg originally. Signs were installed at Pine and Main until the U.S. 29 realignment onto St. John Street. Photo taken 10/05/01. The newest installation for Interstate 585 north, U.S. 176 west, and S.C. 9 north resides beyond where two previous assemblies were posted near Wood Street. Wood Street angles west from Pine Street to Spartanburg Medical Center. Photo taken 08/03/13. Second photo taken 01/16/16. Pearl Street east and McCravy Drive west come together at the final traffic light preceding the U.S. 176 west upgrade to Interstate 585 north. Photo taken 01/16/16. The first guide sign for Interstate 585 lines a commercialized stretch of Pine Street preceding back to back diamond interchanges with U.S. 221 (Exit 25B) and South Carolina 9 (Boiling Springs Road) north (Exit 25A). Photo taken 01/16/16. Exit 25B leaves Interstate 585 north for U.S. 221 (Whitney Road). U.S. 221 heads northeast 14 miles through Whitney and Cherokee Springs to Chesnee. Photo taken 01/16/16. South Carolina 9 splits with Interstate 585 north & U.S. 176 west for Boiling Springs Road north from Exit 25A. The multi-state route leaves Spartanburg for Boiling Springs, New Prospect and Mill Spring, North Carolina. Photo taken 01/16/16. Exit 25A leaves I-585 north & U.S. 176 west for S.C. 9 north and Church Street south back into Spartanburg. Photo taken 06/01/07. One quarter mile out from the half diamond interchange (Exit 24) with California Avenue on Interstate 585 north & U.S. 176 west. California Avenue constitutes a 1.9-mile surface street west to New Cut Road and Una and east to South Carolina 9 (Boiling Springs Road). Photo taken 01/16/16. Interstate 585 north & U.S. 176 west at Exit 24 to California Avenue. California Avenue connects I-585 with parallel S.C. 56 (Asheville Highway), 0.6 miles to the west. Construction realigned the off-ramp for California Avenue in 2015. This guide sign stood in the way and was not replaced. Photo taken 06/01/07. The California Avenue overpass was struck by a truck hauling a crane in January 2014. The bridge was dislocated by five feet, leading to its demolition and ultimate replacement. A 12-month project resulted in a new decorative span that opened in March 2015. Photo taken 01/16/16. A frontage road system accompanies the freeway northward to the three-quarter cloverleaf interchange (Exits 23B/A) with Business Loop I-85. Photo taken 01/16/16. Exit 23B departs Interstate 585 north & U.S. 176 west immediately after an on-ramp from adjacent Milliken Road. 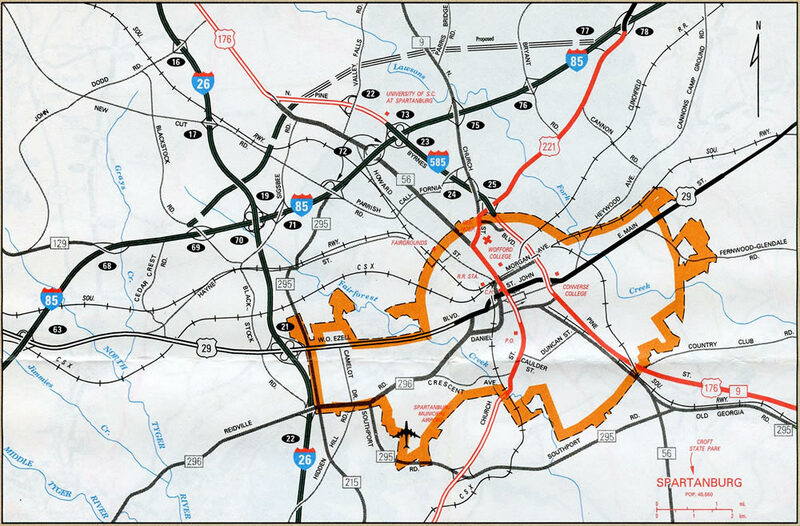 Business Loop I-85 ventures east 3.5 miles to merge with I-85 north for Gaffney and Charlotte, North Carolina. Photo taken 01/16/16. Construction between 2003 and 2006 rebuilt the northern half of the cloverleaf interchange by tightening the ramps. The southbound ramps were unchanged. Exit 23B (not acknowledged on newer signs) joins the business loop opposite the Milliken Road off-ramp (Exit 5B). Photo taken 01/16/16. The loop ramp for Business Loop I-85 south to Greer and Greenville leaves Interstate 585 north & U.S. 176 ahead of the 2006-opened exit for East Campus Boulevard to USC Upstate. Photo taken 06/01/07. The ramp from Business Loop I-85 south joins I-585 north from within the parclo interchange with East Campus Boulevard. East Campus Boulevard was constructed in conjunction with upgrades of I-585 to improve access to the adjacent USC Upstate campus. Photo taken 01/16/16. A diamond interchange follows with Valley Falls Road south to Lone Oak and north to Valley Springs. Photo taken 01/16/16. This reassurance marker for Interstate 585 north precedes the Valley Falls Road overpass. A loop ramp previously left here for Valley Falls Road. It was replaced during the I-585 expansion project. Photo taken 01/16/16. A closer look at what is the first northbound reassurance marker (as of 2016) for I-585 north. Photo taken 06/01/07. A second shield for Interstate 585 was added after the Valley Falls Road on-ramp as U.S. 176 transitions into an at-grade divided highway. Photo taken 01/16/16. The right lane of Interstate 585 north defaults onto I-85 north at the forthcoming diamond interchange while a left turn takes drivers toward Greenville. Photo taken 06/01/07. A signalized intersection ends the freeway portion of U.S. 176 with Upper Valley Falls Road north and Fairforest Road south. Photo taken 01/16/16. Interstate 85 travels east-west for most of its route in the South Carolina Upstate, joining Spartanburg with Greenville and Anderson to the west and Gaffney and Gastonia, NC to the east. Photo taken 01/16/16. U.S. 176 continues north from the I-585 end to overtake Asheville Highway from S.C. 56 en route to Inman. Photo taken 01/16/16. Main Street east at U.S. 176 & South Carolina 9 (Pine Street). Business Spur I-585 was referenced here when U.S. 29 was routed along Main Street. This shield assembly was later removed, but not before the U.S. 29 and tri-color Business shield were bent to face southbound traffic along Pine Street. Photo taken 09/02/00. Second photo taken 10/05/01. Third photo taken 10/05/01. U.S. 221 (Church Street) turns onto Whitney Road to meet Interstate 585 & U.S. 176-S.C. 9. Church Street north continues as unsigned U.S. 176 Connector to become South Carolina 9 (Boiling Springs Road) at its interchange with I-585. Photo taken 01/16/16. Trailblazers posted for Interstate 585 south & U.S. 176 east for California Avenue west from Milliken Road south. Photo taken 08/03/13. California Avenue sees a half diamond interchange with direct access onto I-585 south to Pine Street. Milliken Road provides access to the freeway and U.S. 176 west to Inman nearly a mile to the north. Photo taken 08/03/13. "Agency mapping new route to USCS." Herald-Journal (Spartanburg, SC), February 12, 2001. "Highway project near USC Upstate open to drivers." Herald-Journal (Spartanburg, SC), October 14, 2006. 01/18/04 by AARoads and Carter Buchanan.